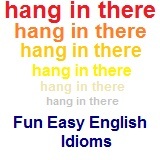 ﻿ Fun Easy English - new american english idioms letter i. In this lesson you will learn American English idioms beginning with the letter I. You will learn the definition and study the usage of each idiom. IF/WHEN PUSH COMES TO SHOVE if the situation becomes serious 1. The president isn’t a forceful woman, but if push comes to shove, she stands firm and lets her feelings be known. 2. I thought my parents wouldn’t support my beliefs because mine were different from theirs, but when push came to shove, they were right there in my corner fighting for me. if worst comes to worst If the worst scenario occurs If worst comes to worst we must cancel our vacation. ill at ease uncomfortable He appeared to be ill at ease during the interview. In a bind is less dramatic than these last two expressions, which would be used when a problem has no apparent solution. Between the devil and the deep blue sea and between a rock and a hard place would not be appropriate in the situations presented in sentences 1 or 3, for example. 1. Can I borrow $10 from you? I’m in a bind. The banks have closed and I need to stop at the supermarket on the way home. 2. Sam is really in a fix. He accepted a job last Friday that he doesn’t particularly want because he didn’t think he would get a better offer. Now he has been offered a job he wants, but he doesn’t know how to get out of the first job. 3. I’m in a jam. I have a doctor’s appointment at the same time as I have to pick the children up from school. Do you think you could get the children for me? in a family way pregnant Our new secretary is in a family way and plans to quit work soon. in a fog confused He is always in a fog and never seems to know what is going on. in a haze confused He is always in a haze and never seems to know what is going on. in a hole in trouble He really is in a hole now that he has problems at work. in a hurry rushed I am in a hurry and cannot talk now. in a jam in trouble He is really in a jam at work. The expression suggests that the words are so few that they can fit in a nutshell. 1. You can’t go to the movies tonight because tomorrow is a school day, you’re supposed to be saving your money, and you just went to the movies last night. Now, if you want it in a nutshell, the answer is no. 2. We’re eager to find out what her plans are. Tell us in a nutshell: is she going or not? in a pig's eye Unlikely that In a pig's eye he is gonna show up on time. IN A PINCH in an emergency; if necessary 1. My car has only six seats but it can carry eight people in a pinch. 2. We would prefer one large double room at the hotel, but two small ones will be all right in a pinch. in a rush in a hurry They were in a rush to get to the party. A rut is a groove or narrow track pressed into a dirt road that catches the wheel of a vehicle and forces the vehicle to go in a restricted path that the driver is unable to alter. The expression connotes going in a direction or doing an activity without being able to vary it. 1. I’m tired of this job. I do the same old thing day in and day out. I’m in a rut. 2. Don’t let yourself get into a rut. Try something new from time to time, and you won’t get bored. in a spot in a difficult situation He will be in a spot if he cannot pass the entrance exams. in a way somewhat I would like to go with you in a way. in a word Briefly In a word, I think that you need to study more. in a world of one's own thinking and unaware of her surroundings She always seems to be in a world of her own. in advance ahead of time They bought the tickets in advance so that they could get good seats. in and out coming in and going out The boss has been in and out of his office the entire day. in any case Absolutely In any case, we can meet at the coffee shop. in any event Absolutely In any event, we can meet at the coffee shop. IN BLACK AND WHITE in print or in writing 1. You can’t agree to buy or sell a house with just a handshake. The agreement has to be in black and white. 2. I didn’t believe what you were telling me was true, but here it is in the newspaper in black and white. The expression originates from the black and white colors of ink on paper. in charge of in control of The new employee will be in charge of production. in deep deeply involved They are really in deep with each other. Synonym: in hot water, in the doghouse, hell to pay In the doghouse is less serious and often light-hearted. To have hell to pay is generally stronger and more serious. 1. My parents said I’d better get home on time or I’ll be in Dutch. 2. The boys got in Dutch with the teacher when they didn’t turn in their homework. IN FULL SWING at the peak of activity or intensity 1. Julie arrived about 30 minutes late and the party was already in full swing. 2. The meeting started at 4:00 p.m. It was still in full swing when the assistant manager arrived a little after 6:00. Synonym: in Dutch, all hell to pay; in the doghouse 1. Cheryl borrowed her mother’s best silk blouse without permission and spilled soda on it. She knew she’d be in hot water when she got home. 2. I got in hot water with my parents because I failed mathematics. Out of one’s element describes being uncomfortable in an environment, whereas out of one’s depth describes being asked to perform beyond one’s capability. 1. Diana is in her element when she’s in the classroom. She’s a natural teacher. 2. I love being in the country. When I’m in the city, I’m lost. I’m out of my element. IN/OUT OF THE MAINSTREAM in the group that represents the majority; out of the mainstream means on the edge of the majority 1. Andy Warhol was a painter whose work is representative of the Pop Art period. He was in the mainstream of Pop Art painting. 2. That politician advocates very extreme views that are entirely different from most of the other politicians. He is out of the mainstream of current politics. Synonyms: out of (one’s) depth/league (sentence 1); bite off more than (one) can chew (sentence 2) 1. Tim can’t compete with these people. They are much more capable in their field than he is. He’s in way over his head. 2. Be careful how much work you take on. Don’t promise to do more than you can handle. Don’t get in over your head. in short supply less than the amount needed These days the amount of oil is in short supply. IN STITCHES, HAVE (SOMEONE)/BE IN) to make someone laugh very hard 1. We hired a very funny clown to perform at the company picnic. He had the children in stitches from beginning to end. 2. The movie was hilarious. We couldn’t stop laughing. We were in stitches. in stock available The new paints are in stock. IN THE BAG a sure thing; success is assured 1. The personnel director said that I was the best candidate for the job and that if I pass the typing test tomorrow, the job is in the bag. 2. I know you think the scholarship is in the bag, but don’t get your hopes up too high. The expression originates from the color of ink that was used on the credit side of a business ledger or account book. 1. The company lost money the first four years but now it’s making money and is finally in the black. 2. The government hasn’t been in the black for the last 20 years. It has been spending more money than it brings in through taxes. 3. Although we aren’t losing money, we’re not in the black either. We’re just breaking even. The expression originates from a game like poker in which chips represent money. 1. I would quit work and spend the rest of my life travelling around the world if I were in the chips. 2. You children are asking for so many Christmas presents, you’d think I was in the money. Usually the “someone” in the expression is a loved one and the situation or trouble is not very serious. In Dutch and in hot water are more serious, and (have) all hell to pay is generally much stronger and more serious. 1. Frank looked at his watch and realized that he was over an hour late for an appointment with his wife. “I’m really going to be in the doghouse this time,” he said. 2. Dianne used her mother’s car without permission and now she’s in the doghouse. IN THE LONG RUN in the end; after a long time has passed (sentence 1); after weighing all the advantages and disadvantages (sentence 2) 1. Jenny couldn’t decide whether to study accounting or law at college. She didn’t know which major she would be happier with in the long run. She might grow to dislike one or the other in 20 years. 2. Brian had his own car, but he chose to take the train to work every day even though it took more time. It was easier in the long run because he didn’t have to tolerate traffic jams, pay for gas, or look for parking. IN THE LOOP informed 1. Sharon had worked with the same team for nearly two years, but she still didn’t feel like she was in the loop. She still had to ask for information from her colleagues. 2. I’d be happy to let you work on that project by yourself, but I’d like to know how you’re progressing. Remember to keep me in the loop, please. in the market for looking for and ready to buy She is in the market for a new car. Compare to: down to the wire; under the wire. 1. The accident victim was near death, but the ambulance arrived in the nick of time and the paramedic saved her. Antonym: under the weather In the pink can be applied to both people and things, while under the weather is limited to people. The expression probably originates from the idea that a healthy person’s complexion is described as pink, while a sick person’s skin is pale or chalky. 1. After several days in the hospital, Paul wanted to go home. He told the doctor he was feeling in the pink and there was no reason for him to stay any longer. 2. I always get my car serviced on time. That way it stays in the pink and I don’t have to worry about it breaking down. The expression originates from the color of ink that was used on the debit (loss) side of a business ledger or account book. 1. Many governments operate year after year in the red. They simply keep borrowing money against the taxes they expect to collect in the future. 2. Some years my business makes a profit, but other years I’m in the red. The expression suggests that people in the same boat share the same bad fate. They will all sink together if the boat capsizes. 1. Jake and I both lost our jobs yesterday. Now we’re in the same boat. 2. Our landlord raised the rent on our apartments, and none of us can afford to stay here any longer. We’re all in the same boat. in the works being planned The new line of products is in the works. The expression can be traced back as far as Shakespeare’s play Julius Caesar, and probably originates from the idea that the Greek language uses a different alphabet from English, making it difficult for English speakers to hear or understand. 1. I’m not very good at understanding the directions on how to assemble these modern-day toys. They’re all Greek to me. 2. Can you tell me what this page says? I don’t even know if it’s right side up or upside down. It’s all Greek to me. IT’S NO SKIN OFF (SOMEONE’S) NOSE it has no effect on someone or it is of no concern to someone 1. I think you’re crazy to spend your money on that car, but it’s your decision. It’s no skin off my nose. 2. Don’t tell me what to do with my life. It’s no skin off your nose if I choose to quit school. The expression suggests an ivory (white) tower high above the masses. An ivory tower is often associated with an academic or university environment, which is said to be isolated from the real world, e.g., business and politics. 1. The boss felt that he couldn’t consider Richard for the difficult job of manager because Richard seemed out of touch with the workers. He was isolated in his ivory tower. 2. When the professors complained that the students couldn’t meet the academic standards of the past, they were told that they should come out of their ivory tower. More students attend the university now and it can’t be as selective as it used to be. Hey do you know any English idioms beginning with the letter I not listed on this page?